Today is officially the last day of primary school for the summer and I’ve been stocking the deep freeze with cakes and treats for the next few weeks. I really didn’t want to be slaving over the hob for ages. This pea salad takes about 7 minutes to make from start to finish, including boiling the kettle. Longer if you add meat. This time last year we were gorging ourselves on fresh peas, shucked from the raised beds in the garden, eaten on the doorstep. Because of the bad weather our peas are only beginning to flower now which means it’ll be at least a week before I’ll be able to eat them pod and all. That’s an optimistic estimate by the way! In the meantime I’m making do with my freezer stash of peas for fresh salads. The beauty of frozen peas is that you don’t have to heat them. Providing you’ve stored them correctly in the freezer all you need to do is to take them out about 30 minutes before you want to eat them OR you could boil a kettle of water and quickly immerse the frozen peas for only 30 seconds (then drain) to revive them straight from the icebox. 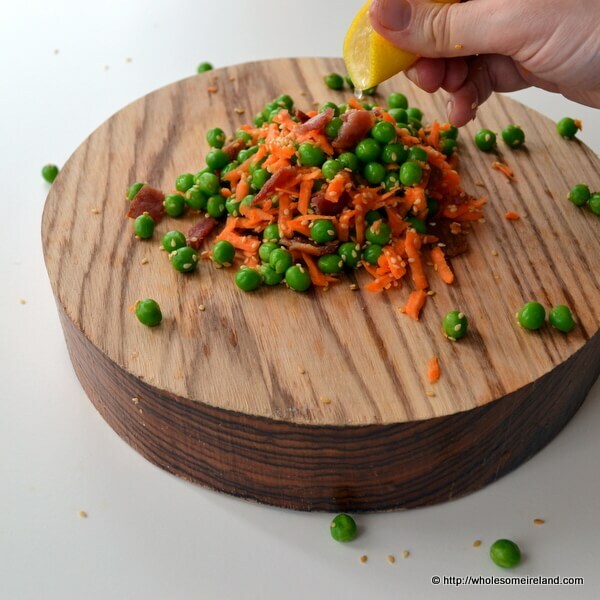 I peel a small carrot and shred it straight into the bowl with the peas, add some toasted sesame seeds, a squeeze of lemon juice and you have a fresh, vegan, pea salad. You may need a dash of soy sauce or a sprinkle of sea salt to lift the flavours. Alternatively you could do as I did tonight and crumble a piece of bacon into the bowl which adds a wonderful salty note and bite. Good salads for me aren’t always about an oily dressing and that’s certainly true here. The only liquid I add is the lemon juice; less is more. Pea salad – real fast food in less than 7 minutes. Delicious! I love peas… Waiting for ours to be ready from the polytunnel too! I far prefer peas to strawberries actually and to me they are the ultimate summer treat, still warm from the sun. Counting down the days!!! Raspberries eaten warm in the garden are my very favourite but peas run them close – as does raw asparagus just snapped off and eaten. Couldn’t agree with you more about how unnecessary rich dressings are. Those are strictly for tasteless boring iceberg lettuce. Yes! Although I do like iceberg hearts eaten with cracked black pepper. As always, the “kiss method” is best when it comes to fresh food I think. Mmmm warm raspberries in sunshine! Alot of rubbish is talked about oily dressings. I’m not talking about those toxic shop-bought oils loaded with goodness knows what in them, but a fresh homemade dressing made with extra virgin olive oil, (mixed with balsamic vinegar and lemon juice) actually speeds up metabolism, reduces inflammation in your body, improves blood sugar metabolism and therefore helps to promote weight loss! Thanks Yvonne. From a taste point of view this salad doesn’t need any oil at all. If you prefer it with a dressing though go right ahead!